16 racial justice organizations that are currently part of Akonadi Foundation’s Arc Toward Justice Fund (ATJ) are building collective power to shape the policies and systems that affect communities of color in Oakland. 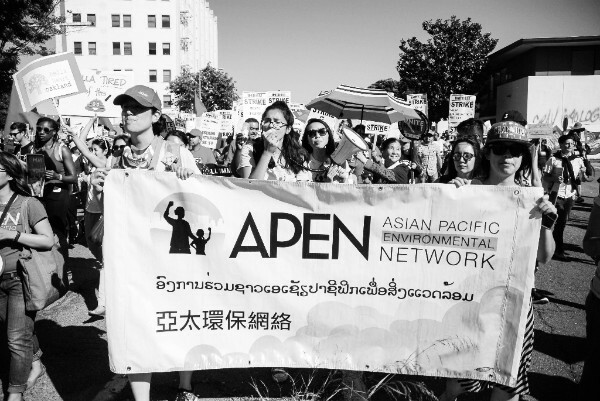 We’ll be lifting up the work of our ATJ grantees through our monthly spotlight series, and for Asian Pacific American Heritage Month, we feature two of our grant partners: AYPAL -Building Asian & Pacific Islander Community Power and APEN– Asian Pacific Environmental Network. We spoke with Joshua Fisher Lee, Aypal’s Project Director and Rachel Lee Holstein, Apen’s Development Director about their current campaigns. AYPAL: Our #WeHere campaign encompasses both Asian American and Pacific Islander (AAPI) youth visibility in the areas of data disaggregation, as well as Oakland youth responses to gentrification and displacement. We successfully pushed the Oakland Unified School District to pass a disaggregated data resolution for AAPI youth in 2016 — the first of it’s kind in the state — and we’re now supporting the Latino community in Oakland, as well as groups in San Francisco, to pass a similar resolution. In addition, we recently released the “Raising AAPI Visibility” report, which sheds light on the need for understanding the experiences of all AAPI youth within the large umbrella of the identity. APEN: APEN has been organizing low-income Asian American immigrant and refugee communities in Oakland for over two decades. Bringing together a collective voice to develop an alternative agenda for environmental, social and economic justice, APEN values healthy communities and a thriving local, living economy in Oakland for young people of color. Our most recent work in Oakland focuses on winning protections for Oakland tenants, pushing for a ban on coal, expanding community-owned solar energy, and organizing immigrant and refugee residents to get involved in the Participatory Budgeting Project. AF: What will you be focused on for the rest of the year? 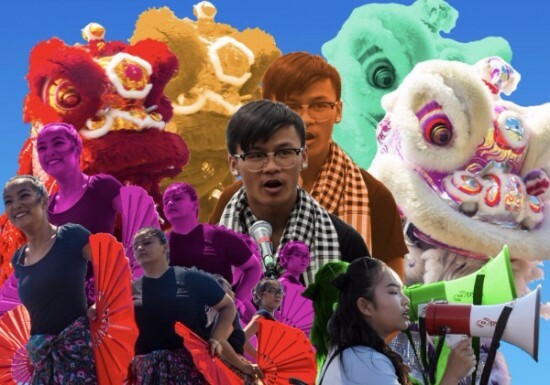 AYPAL: We’re looking forward to celebrating our 19th Annual May Arts Festival, “Rooted In Culture”, right in the heart of Chinatown at Lincoln Square Park. The park is a youth space that is in danger of being overtaken by a six-story market rate housing development that is an entire city block in length, to be built in the next five years. Our youth played an active role in supporting the community to get a Community Benefits Agreement from the developer. But the the project is moving forward. Given this and similar developments underway, our youth will play courageous leadership roles to redefine a space for themselves in Chinatown. AYPAL youth leaders partnered with other local groups to launch the Chinatown Improvement Initiative, an improvement initiative that addresses street cleanliness, cultural advancement/capital improvements, and community building. APEN: Our work is centered around “Just Transition”– a transformation of the extractive fossil fuel economy to a clean, equitable, and democratic economy. APEN is currently focused on several key projects that will move us closer to the Just Transition we seek. These five priorities include Asian American voter engagement, climate justice policies, the fight against gentrification and displacement, launch of a cooperative incubator and Just Transition loan fund, and a locally owned and operated solar energy project. We are also organizing our annual Our Power Festival in Richmond in August. AF: Are you working in partnership with other Akonadi grant partners in the Arc Toward Justice Fund? AYPAL: We have just begun meeting with Urban Peace Movement to discuss the ways in which youth across the city can connect around a multi-racial campaign against gentrification. We are excited about planning together over summer via site exchanges with our youth. We have also been in discussions withCommunities United for Restorative Youth Justice (CURYJ) to support our gender justice work through cultural based healing practices. APEN: We are working with Arc Toward Justice grant partner Public Advocates to maximize the benefits from the Greenhouse Gas Reduction Fund in low-income communities and communities of color that suffer first and worst from climate change, racism, and inequity.